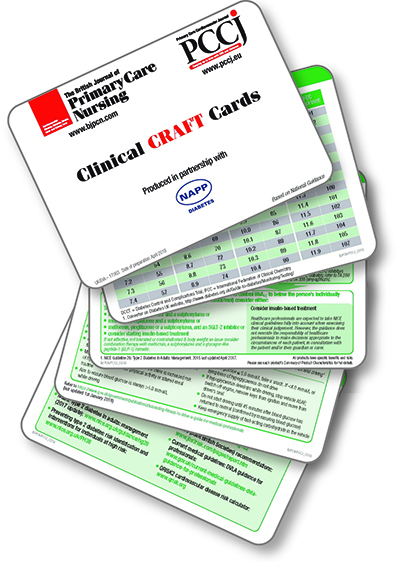 A concept created by the Consultant Editor of BJPCN, Jan Procter-King, the clinical CRAFT cards have been designed as a ‘handy-to-use’, pocket-sized memory jogger and reference guide for healthcare professionals in their daily practice. Risk factors, assessing and managing risk, diagnosis, HbA1c, targets, weight conversion, targets, blood glucose, diabetes drugs, ADA|EASD update & recommendations, driving and CKD in diabetes and much more. Produced in partnership with NAPP. 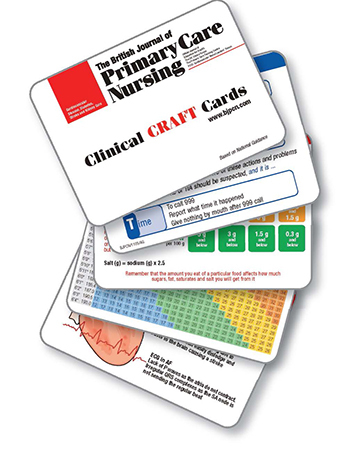 Each set contains up to 15 double-sided, colour-coded cards on a key-ring, allowing the user to add new and updated cards and develop their own personalised set. Full of useful risk charts, conversion tables, targets, thresholds, diagnosis information and much more, each set contains everything a HCP needs when consulting with patients. Sponsored sets are available free-of-charge* to HCPs. Other sets are available to buy individually dependent on print runs and stock availability. New or updated sets are available for sponsorship. Sponsors may add their logo to the front cover, any necessary disclaimers and information on the inside cover card. Minimum print runs of circa 2,000 sets are required in order to cover the cost of development, design and production of sets for free-of-charge distribution to HCPs. Sponsors are also invited to include 1 double-sided card with their own content within the set. Distribution options vary from bulk delivery to despatch of individual sets. We can assist with advertising, distribution lists, educational partner members and conference give-aways. Bulk buying of generic sets is also possible without direct sponsorship of the complete set. CCG’s, societies, networks etc will be invited to pre-order bulk quantities offering the flexibility to order smaller quantities. An overall minimum print run of 2,000 sets is still required to cover the cost of development, design and production. Topics will include: Positive cardiometabolic health resource, monitoring, physical health pathway, smoking, lifestyle, food content, hydration, weight conversion, BMI, MUST tool, hypertension, diabetes risk, HbA1c, blood glucose, CKO, blood lipids, Audit C and alcohol, NEWS, dysphagia, sapsis and DUT ….